Jack, I was the tall guy that bought this canvas my first stop in Stone Harbor. I had a couple of pics on this wall that didn't bring your eyes to it..
Now... it's the focal point of my living room.. I have another of your canvasses and just adore your work!! Jack, Thank you very much! We are so happy to have found you at the craft show! I wound up needing emergency neck surgery this past week, so this picture is a nice pick me up! My picture arrived today and I love it! It is perfect over my sofa!! I also love the other pictures I purchased from you at Springfest in Ocean City, Maryland, earlier this month. I look forward to seeing you next year at Springfest and I am sure I will find a spot for something else between now and then. 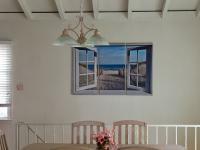 Jack, The panoramic prints look great in our house, specifically the lighthouse photo over the fish tank. My girls are also very grateful for their prints as well, which we have already framed, and have hanging in their rooms. Thank you again and we look forward to future pictures you post from your next Mediterranean trip. Hi Jack, I spoke with your wife at Artfest today and told her how much we love our pictures we have bought from you over the years. This sandpiper picture really brings out the granite in our bathroom. She asked me to email a picture for your website. Have a wonderful day! Hi! Jack, Just wanted to let you know that we received both packages yesterday and they are beautiful. Thank you so much for including the extra print. We are anxious to display all the prints in our home. We send best wishes for the New Year. Thank you so much for the beautiful print- it is a wonderful reminder of good memories of better days at the shore. The frame arrived in perfect condition and looks great. We will watch your website for events in Florida and hope to see you there. Hi Jack, Thanks again for your Clean Ocean Support. You will be receiving official thank you from the Cindy and the staff at Clean Ocean shortly. Dear Jack, I want to thank you for sharing your beautiful photography on canvas. For the past 3 years now, we have been admiring your talent, and we finally were able to make our dream purchase. You have a wonderful gift! We couldn't wait to get home from the Ocean City festival to hang our new treasures. We look forward to many years of enjoyment. Dear Mr. Macey, We received the wall hanging "Beach Clouds & Dunes" which you sent to us. We hung the picture immediately over our fireplace in Avalon and it is truly beautiful!! It gives me pleasure every time I enter the room. Dear Jack, Thank you so much for the beautiful beach canvas. My husband loves it too and it's already hanging up in our living room. It was hard pick out of all of the amazing pictures, but beach chairs in low tide is close to my heart because that is what my family did when I was younger. Starfish are also a favorite of mine, which is why your "White Starfish" photo would be perfect for our wall. Thank you so much for adding so much beauty into our home. I can't wait to show my friends and family! Hi Jack, My husband and I went to the art show in Montauk last Sunday and we fell in love with the Beach scene with Roses that were 3 panels and I said I would email you once I had a chance to measure. Well good news it will fit! So first of all, is this still available? And if so, what will you need from me to purchase them? Dear Jack, Thank you for the lovely pictures……I am very excited to display your beautiful collection throughout our home. Jack, Just a note to let you know that we received the picture yesterday..... Many thanks for sending it out so soon. We also appreciate the two other pictures of the ocean….they are very pretty and and we will enjoy putting them in our new home. Hello Mr. Macey, My mom and I found a picture we loved at the Avalon/ Stone Harbor Craft show. However, we weren't sure which size we needed for the room. We were told we could order the prints online so we just went home to measure. We still love the picture. Hello Jack, I received that amazing canvas last night and I am going to hang it today. Thank you so much for sending the canvas before we leave for Florida and we will have a few days to admire it on the wall. Hi, My Mom and I saw your photographs at the LBI fair a couple of weeks ago. I should have inquired then but I was with my Mom. It's her birthday on Thursday and I wanted to get her the 18x48 "beach chairs at low tide" print. Jack, We wanted to let you know that the 16x36, Barnegat Light picture was delivered this afternoon. It looks great on the bedroom wall and compliments the other beach scene that we purchased from you last year. Thanks again and maybe we'll see you somewhere at a show on LBI this summer. Hi Jack, I met you and your wife at ArtiGras this past weekend. I love your photography and I am interested in ordering a panorama canvas gallery wrapped image. The image is of the Jupiter Lighthouse on the right side and a bird on the left. This is a surprise birthday gift for my husband who also loved your photography. Jack, Our picture arrived today and we hung it up right away. Thank you also for the two cards which were included with the picture. We are very happy with everything. Mr. Macey, Pictures arrived in splendid condition and all photos look great. Hope to see you in Stone Harbor again next year. Have a great holiday season. Hi, Thanks for spending so much time with us today. We already hung the picture, and it looks wonderful. We decided on another picture to have enlarged as we discussed today. The name of the photo from your website it "Flowers on the Bay". Val wanted to know if it could be done by the first Friday in November, we have a dinner party for Val's co-workers. She would love to have it hanging on the wall. All photos were received yesterday in fine condition. Nice job Jack! Jack, Thank you and Sandra for the time and care spent with me at the Heritage Festival in Lavallette, NJ, this past Saturday. All the photos are just beautiful. I love your work, and sincerely hope we can purchase more pictures from you in the near future. Good Morning Jack, I hung your picture and I love it. Thank you. Hello Jack, I met you in Ocean City, NJ this past fall and just love your pictures. I bought one for my bathroom and I am now interested in purchasing the September Surf gallery wrapped picture in the 18x48 size for my living room. I look forward to your response. Hi Jack, We were surprised to receive our custom-sized "Walk on the Beach" today 9/28, just three days after your show. It arrived in perfect condition. You really know how to pack your pictures. Thank you for spending time with us to figure the sizing for our frame. You have all the answers. We will enjoy your excellent photo of the beach for many years to come. Thank you. We are very pleased with your work. Hello Jack, Wanted to drop you a quick line and tell you how nice it was to meet you and your wife at the Art Fair in Eisenhower Park on Saturday. We love the two prints we purchased from you. I hung them both the other night and they look great! Thanks for taking the time to show us your work and helping us decide which prints to buy. We are very happy!! Hi Jack, I received the picture today. Great job, it looks beautiful! Thanks for getting it ready & shipped with so little notice. Let me know when you have anything exhibited in the area. I would love to see more of your work. Dear Jack, I received “Spin of The Wave” today and I was like a five year old kid at Christmas. I couldn't wait to open it. Bottom line.......I think the picture came out great and I am very happy with it. I just hung it on my living room wall above my couch and it looks terrific. It's the main focal point of my apartment. The backing was done neatly and the hanging brackets are secure. I also liked your gold signature. It's easily viewed from the side but is nonintrusive when in front of the picture. I appreciate the meticulous care taken with the packing. Thank you again for your time, effort and professionalism. You did a great job. Hi Jack, I just wanted to follow up on our conversation this past Saturday and Sunday at the Stone Harbor Arts and Crafts Show. On Saturday we purchased "Curving Beach Fence" from you and hung it on our wall in our Avalon condo. The colors are so bright and the picture so calming - it put my husband to sleep. We loved the picture so much we had to return to the Show on Sunday to purchase another picture. This time we chose the lighthouse. It also looks beautiful on our wall and we can't stop looking at it. Hopefully you enjoyed this show and will return next year. We look forward to attending and purchasing another one of your beautiful pictures. Thanks for bringing this enjoyment into our home. Hi Jack, I am so happy to have happened upon you and your beautiful pictures this morning! When I got home, I went straight to my cousin's house and he told me that he had bought one yesterday! I went into their kitchen and low and behold, it was the EXACT same photo that I chose, but in the larger size! Great minds! Meanwhile, his wife and daughter headed out again to see what else they could get! Really beautiful! Thank you. It was nice meeting and talking with you. Hi Jack, the picture "Way to the Beach" arrived today. It is absolutely gorgeous! I am giving my daughter the picture as a Christmas gift and I know she will be thrilled with it. Thank you so much!